Wildlife expert Geoff Grewcock, of Nuneaton and Warwickshire Wildlife Sanctuary, said a bite from this type of spider "could kill you". Are spiders often found in fruit? 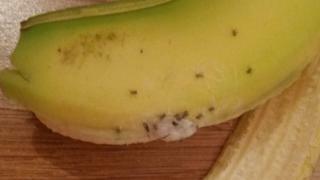 "I had brought a banana up to my bedroom and opened it and I think I must have broken an egg sack because hundreds of these tiny spiders went everywhere," Ms Price said. "They landed on my arm and I just started thrashing. They went all over the bed and some on Leo's cot. "I called the police and they said I should evacuate the property straight away. Luckily my mam lives across the road." The mother added she had yet to feel "settled" after moving back home. The banana was bought at the Stanley branch of Asda. The store said such incidents were "extremely rare" and checks on stock were regularly undertaken. The company said it organised a specialist team of pest controllers to attend the Price family home.